This piece of crazy quilting is a part of my latest project which as regular readers will now is a hussif , a type of traditional sewing caddy. This piece will be a pouch/roll that will sit inside the hussif. If you click on the image you will see a large version. Last week on my work in progress post, when I wrote about this project I explained how I always do the embroidery and then add beads, buttons and charms. I was at the stage in the process where I was about to start adding beads. This week I would like to say I have done that and finished the piece so I am ready to move on making 2 internal pockets. I think readers would like to see and read about some of the details so here they are! Once again click on the image to see a larger view of it. On this section I used half a hand dyed doily. I used procion dyes to dye it and it was added into the seam as I pieced. The Woven Zig zag chain that I worked over rick rack is a TAST stitch . The Feathered Up and Down buttonhole (on the left) is also a TAST stitch. I used my Crazy quilt templates to create the curved lines in this little motif . 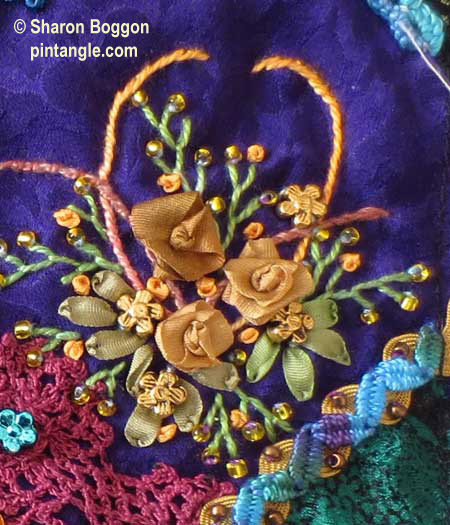 I traced off the lines using the template then stitched them in stem stitch before adding the silk ribbon fargo roses , feather stitch, French knots and beads. 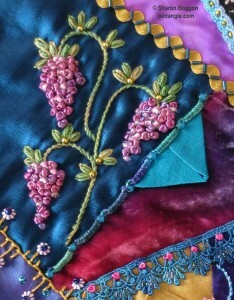 For the stems of this vine once again I used my Crazy quilt templates to create the curved lines of the vine. Click on the image to see a larger view and enjoy! I’m way behind on the Tast stitches because I have been doing this WIP quilt. It has a lot of hand stitching but not embroidery. I do really enjoy seeing everyone’s work. Thanks for sharing so many details, it’s a pleasure to look at! 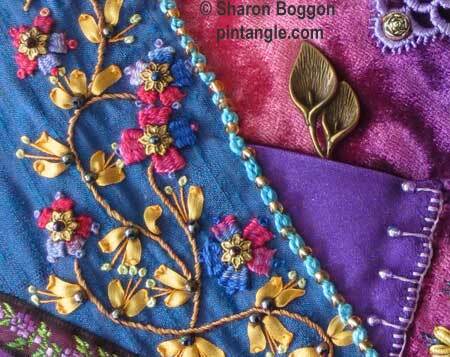 What great progress and I love the colours and all that fab embroidery. I am going to come to a screaming halt on this piece as my PC is at the computer repair man and he is very slow at repairing. Beautiful progress, Sharon. You are so good at combining TAST stitches, ribbon work and beads. I have added some more TAST stitches to my Swedish cushion and come quite far on my TAST reference chart. I find the latter a very helpful ‘tool’.